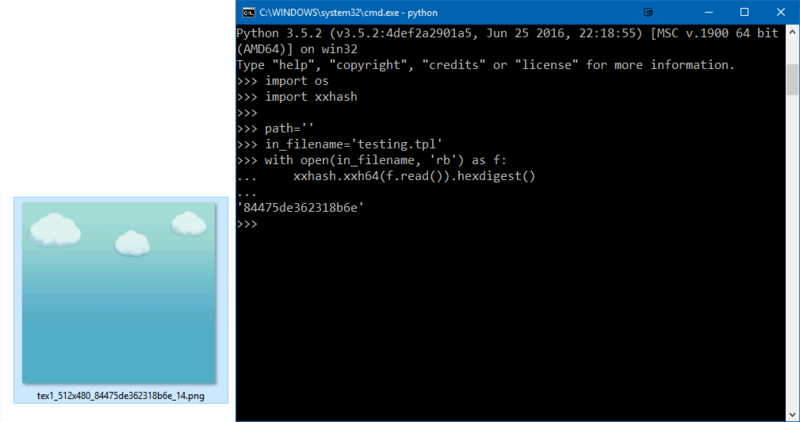 What exactly is passed to XXH64 when creating hashes? (10-06-2016, 02:10 AM)JosJuice Wrote: If the image data you get from this is identical to the image data you would get from Dolphin, it's possible to write a program that calculates image hashes in the same way as Dolphin. From what I understand this states that the data should be 8-bit RGBA. I'm not fluent in C++ so I have no idea if the code reflects that comment. Tbh... not even sure what I'm saying makes sense. I tested the go version and the python version of XXHash. The thing is I'm obviously doing something wrong because they're giving me different hashes for the same files! I attached the python script and the xxhsum.exe (might require go to run, I have no idea). Here's the .py script I wrote. Sorry, if these questions sound really stupid. Never done any real coding in my life until now. So it hashes the texture in the native GC format, which is tiled and often encoded in uncommon formats. Hashes match! Thanks a ton!